Hundreds of people in the U.S. have mysteriously developed meat allergy over the last few months. And this rash of meat allergies, currently sweeping the East Coast of America, appears to have been caused by one single, little species of tick. 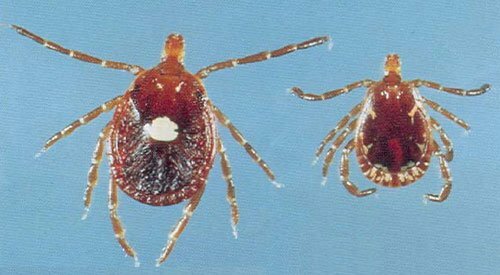 The lone star tick (Amblyomma Americanum), which is named for the tiny white spot on its back, may look harmless, and only causes a tiny little prick on your skin – but what follows next is a complete and potentially life-long, aversion to meat. Dr. Scott Commins, the assistant professor of medicine at the University of Virginia, said the animals’ saliva trickles into the wound and causes the violent reaction – which can cause potentially deadly allergic reactions. He said: “People will eat beef and then anywhere from three to six hours later start having a reaction; anything from hives to full-blown anaphylactic shock. He said he had seen about 400 cases, of which 90% of the patients had a history of tick bites. Dr. Scott Commins plans to research into the effects of the tick saliva on the human body’s natural antibodies for alpha-gel, which is contained in red meat, lamb and pork. He said the antibodies in the blood rise after lone star tick bites – and hopefully experiments will prove this is the mechanisms causing the allergies. Allergies usually first appear in children and rarely start in adults. The most common allergies include peanuts and pet hair. But for adults who have been meat-eaters all their lives, suddenly developing this allergy could be difficult.